No bridge? No problem. Just drive across the river. Bridges aren’t the only way to cross the Little Missouri River. We found several unusual crossing including a cable car on a cable across the river. But that’s off limits. These three are our favorite unusual crossings that you can access. South of Bowman, in Slope County, is the (Three V) VVV Crossing. It’s not always dependable. For example in March, when we first went there, it was impassable. Later, when the river settled down to the easy life of summertime it’s easy crossing on the raised concrete roadbed. You can get to the VVV Crossing from the Marmarth Road, old highway 16 starting at Sentinel Butte in Golden Valley County. Head north toward the Historic Elkhorn Ranch. Just south of the Elkhorn Ranch is the Ellison Creek Crossing. It’s a little unreliable. The sand can get you stuck. About eight miles north of the Elkhorn ranch are two crossings: Maah Daah Hey and Morgan Draw. The narrow trail coming in from the upper right to the river behind the two cows is the Maah Daah Hey trail. North of the Elkhorn Ranch is the regular crossing for the popular Maah Daah Hey Trail. Hikers, mountain bikers and horseback riders have no problem crossing here. Horseback riders will keep their feet dry. Hikers and bikers? Prepare to get your feet wet. We went up a trail that extends off of Beaver Creek Road. There, we could look down on the crossing. We picnicked and watched the cattle use the Maah Daah Hey Crossing. Further north is the Morgan Draw crossing. If you are in a street vehicle, don’t try it. You’re likely to take on water at the deepest point of the crossing; the western side is the channel and it’s a shade deeper than the rest of the crossing. A four-wheel drive pickup, especially one that is deemed by the manufacturer to be “off road” will have enough clearance to get you through the water. Something like an SUV or a cross-over may not be able to keep water from seeping under the door. When we crossed, it was about two feet deep in the deepest channel. Bonus: Trails in both units of the Theodore Roosevelt National Park cross the Little Missouri River. In the South Unit (Medora) you can cross north (downstream) of the Peaceful Valley Ranch at least two locations. You will get your feet wet. See this? It sounds like if certain transportation officials get their way, a bridge across the Little Missouri River will be built not far from the Elkhorn Ranch site. 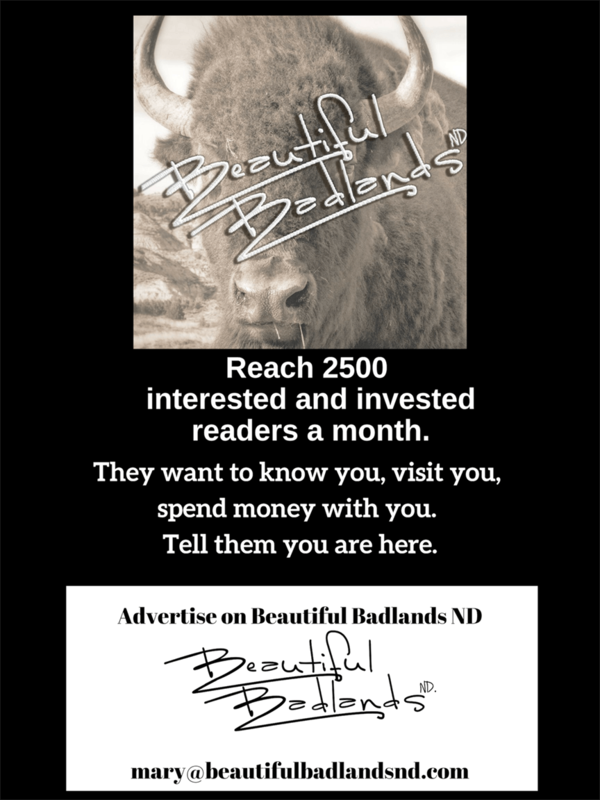 Want to sample a bit of the North Dakota Badlands? If we know your criteria for a visit (time, distance, activity) we can recommend a travel plan. Road trips are always an option any time of the year. The North Dakota Commerce Department, Tourism Division has plenty of ideas for you to sample in the Badlands. We love to present the story of the Beautiful Badlands to groups and clubs. Give us a shout, invite us in, and we’ll speak to your group. Follow us on Facebook, Instagram, or Twitter to keep up on events in the Badlands (from our calendar of events), or to get ideas of tasty treats each Tuesday. Glad to read the comments you post here. We love it when people give us feedback. Tasty Tuesday is tomorrow, so come back to see another place to eat in Golden Valley County. be sure to subscribe to get a notice in your email inbox when a new story is posted. The Things to Do page is full of events. Have we missed any? Let us know.